Imagine the tiny, cramped interiors of a hospital closet. A harsh fluorescent light is causing organic shadows to escape from the stacked spare beds onto the walls behind them. A stifling relationship between organic shapes and geometric interiors starts to appear. This unusual space and relationship is what inspired Tulsa artist, Justine Green, to create her Concept/OK piece titled, Bed Space. Using paint as a medium, Green was able to further enhance the expressive relationships between shapes and form that surface within the piece. I was able to learn more of her intent as well as the specific process she took in creating the piece. Q: What do you want your piece to say to its viewers? JG: I would want the viewer to have a bodily response to the imagery despite the absence of the figure. The intimate scale of the work should invite the viewer to come close to the piece. The viewer should have a sense of familiarity with the subject but not in a way that describes a narrative. Q: Technically speaking, how did you execute this work? JG: This work is a finished painting. My interior paintings begin from observation and include objects I find in life. In the process there comes a point when direct observation ends and improvisation and invention take over. This distance created by abandoning observation allows for the painting to take on a separate life where I can exploit certain moods or atmospheres. Q: What is your favorite medium in which to work? Why? JG: Paint, particularly oil paint, is my favorite medium. There is a never ending fascination with taking what is basically mud- oil and pigment- and smearing it onto a surface to create recognizable forms. I allow for a lot of time to elapse while making a painting. This time allows for new ideas and drastic changes to be generated before the painting is finished. The physicality of my marks often gives evidence to a history of changes. I like how these marks place significance on process and its role within painting. The Concept/OK: Art in Oklahoma exhibition welcomes to the public through February 16, 2013 at the new Tulsa Arts and Humanities Council’s Hardesty Arts Center. Admission is free of charge. See www.concept-ok.org for more information. See Gregory Ruppe’s Residency artist video profile here. Background: The Concept/OK: Art in Oklahoma exhibition welcomes the public until February 16, 2013 at the new Tulsa Arts and Humanities Council’s Hardesty Arts Center. Ruppe’s residency project remains on display throughout the exhibition. Commonplace among households, the piano occupies a space of both reverence and burden. It is simultaneously cherished and unwanted. Its historical presence is bound to a collective memory that resists our willingness to discard it, though its typical inactivity reduces the object to an impractical piece of furniture inhabiting dead space. Using the piano as metaphor for greater social constructs, Things will never be the same takes an indeterminate position to question our nostalgia for the past, our relationship with the present, and the potential of activation when relinquishing control to the unknown. Born in Houston, Texas, Gregory Ruppe received an MFA in Sculpture from Texas Christian University in 2012. He utilizes a broad range of mediums including castings, drawings, video, and sound to create installations and project-based works. He has exhibited regionally and internationally, most recently at Nasher Sculpture Center (Dallas) and Hiroshima Art Center (Japan). Ruppe is also a founding member of HOMECOMING!, an experimental art collective based in Fort Worth, where he currently lives and works. Read more in this previous postabout Ruppe’s residency. See Narciso Argüelles Residency artist video profile here. “Heaven Spots” is an old urban art term that refers to high areas on buildings where street art is done; it also references the perils of working on such hard-to-reach sites. Public art has a long tradition in the Mexican culture that I—and the many Mexican-Americans in Oklahoma—belong to, from the Aztec murals, the frescoes of Diego Rivera, and the 1960s Chicano murals. My art reaffirms my culture and also protests injustices by reinterpreting familiar objects and icons in an unexpected manner. House Bill 1804 is an example of the anti-immigration climate in Oklahoma that I fight against. For me, this is part of my culture. This is not Street Art. Narciso Argüelles is an artist and educator living in Edmond. His art has been exhibited all over Oklahoma and around the world including a two person show at the [Artspace] at Untitled Gallery, Los Angeles Contemporary Exhibitions Gallery, Intar Gallery, the Ninth Biennale of Sydney Australia, and the First Johannesburg Biennale in South Africa. Argüelles’ fine art photography includes experimentation with printing surfaces, sometimes called Digital Alchemy. Some prints are done on aluminum and copper. Argüelles’ goals include the promotion, preservation, and celebration of Mexican, Chicano, Latino and Indigenous art. Read more in this Art Focus Oklahoma magazine article or in previous posts hereand here. The Concept/OK: Art in Oklahoma exhibition welcomes the public until February 16, 2013 at the new Tulsa Arts and Humanities Council’s Hardesty Arts Center. See www.concept-ok.org for more information. See Sarah Hearn’s Residency artist video profile here. Lichens are unusual composite organisms that exist only through symbiotic partnerships between fungi and alga or cyanobacteria. Taking my cue from this collaborative gestalt, Symbiotic Cooperationexplores the power and impact of collaboration with other people and is dependent on public participation. Lichens have been collected and submitted internationally. Each sample received has been: identified, described, scanned, photographed, drawn by hand and added to the display. The display will change as discoveries are made and new lichens added. Upon the exhibition’s completion, these samples will become publicly accessible for future study at the University of Central Oklahoma and the Oxley Nature Center herbariums. Sarah Hearn is a full-time artist living and working in Oklahoma City. Her work is idea-driven by a multitude of scientific theories. As the artist states, “science is always transforming our idea about the world and the reality in which we live. We live in a time where science renders humanity as more and more insignificant.” Hearn received her MFA in 2010 from Rochester Institute of Technology and her BFA in 2001 from the College of Santa Fe. See Garry Noland’s Focus artist video here. The Concept/OK:Art in Oklahoma exhibition welcomes the public until February 16 at the new Tulsa Arts and Humanities Council’s Hardesty Arts Center. 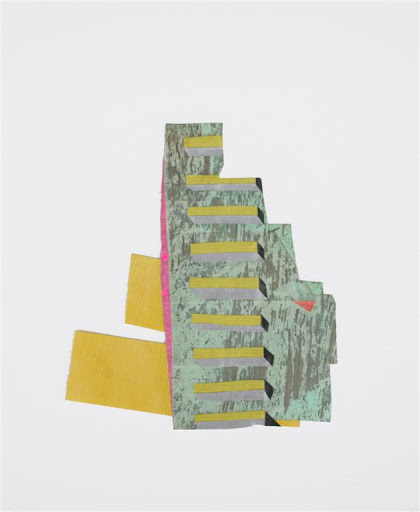 Through a partnership with the Charlotte Street Foundation, the Focus artists will also present their work at the La Esquina gallery in Kansas City in March 2013. The Focus OK-KC component includes four Oklahoma artists and five Kansas City, MO artists developing new work for the exhibitions in both Tulsa and Kansas City. Read more in this Art Focus Oklahoma magazine article about the Focus artists. I mark time and make things by building up layers of material. It has been a fundamental occupation of mine for as long as I can remember. I think of my grandmothers’ rag rugs and quilts made from scraps of old cloth. They wouldn’t have called themselves artists but they did what artists do: transforming material and experience into new identity and function. I am finding out what the correct level of finish is in each work, the whole body of work and what goes with what. Garry Noland, originally from South Dakota, has lived in the Kansas City area over 50 years. His 2013 group and solo exhibits include Bemis Center for Contemporary Art (Omaha, NE), Indianapolis Art Center, ROYGBIV (Columbus, OH), Weekend Space (Los Angeles, CA) and The Studios Inc. (Kansas City, MO). Recently his work has appeared in New American Paintings (#101) and PatternBase. Noland is currently an artist-in-residence at The Studios Inc. in Kansas City. He earned a B.A. in History of Art from the University of Missouri-Kansas City. See www.concept-ok.org for more information. Mixed-media Oklahoma City artist George Wilson serves up an interesting conjunction of material and content in his piece for the Concept/OKexhibition. 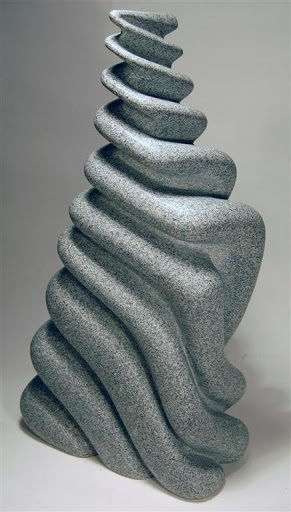 Wilson carved Soft Serve from Elberton gray granite, a sculpture that emulates freshly pulled soft-serve ice-cream. The “layers” lay together so perfectly, with smooth, undulating lines that twist upward and separate as they reach the top. Wilson has participated in numerous exhibitions, the last eight of which include a variety of media, from carved granite sculpture to jewelry work, to print-making and photography. Wilson challenges himself with his art so as to eliminate boredom and monotony. CL: Can you describe the process you used to create your works, especially Soft Serve? nothing specific in mind, random lines and colors that collide, which I later evaluate to see where they might take me. I think about materials I might use and their juxtapositions. I think about the content I want to convey. Soft Serve is an offshoot of these drawings on paper as well as 3-D miniatures made in clay. CL: What inspired the creation of your Concept/OK piece? net” so to speak. I get bored when it gets too predictable or I make too many pieces in a series. The craft of art is my love. CL: What would you like viewers to take from your work? GW: This work was purely designed to be the focal point in a garden. I want this work to be such that it could be revisited over and over again without becoming boring, seeing something new with each visit. 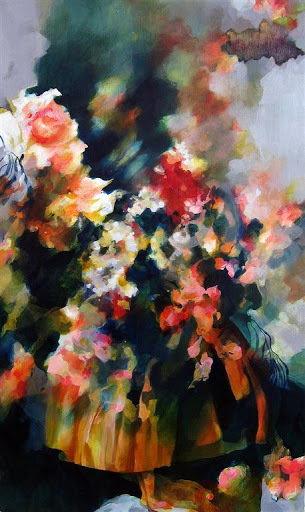 Oklahoma City artist Sarah Atlee paints primarily with acrylics. She enjoys their versatility, the textures they create, and the endless options of implementation, be it via a wash, a glaze, or impasto application. Utilizing the quick-drying advantage of acrylic, Atlee layers infinite colors and textures to create her works. Atlee considers herself to be “a complex and biased filter of information.” Absorbing “words, sounds, images, and experiences from everything [she] comes into contact with,” Atlee processes what is relevant and discards what is not. What remains is a combination of instances that fascinate her, which make “intuitive, unexpected connections.” By combining this “variety of source imagery and found materials,” Atlee arranges them into collages, and synthesizes this collection of visual information into her paintings.